Home > Notre Dame Football > Defending the Option: Who Takes Over for Te’o? Before the Irish started their 2012 season against Navy, I had a detailed post describing how Bob Diaco runs Notre Dame’s defense against an option attack. In short, Diaco throws the 3-4 away for such games and switches to a more traditional 4-3 look. The catch though, was that Diaco had another wrinkle in the assignment football that you usually see in the option: Manti Te’o. 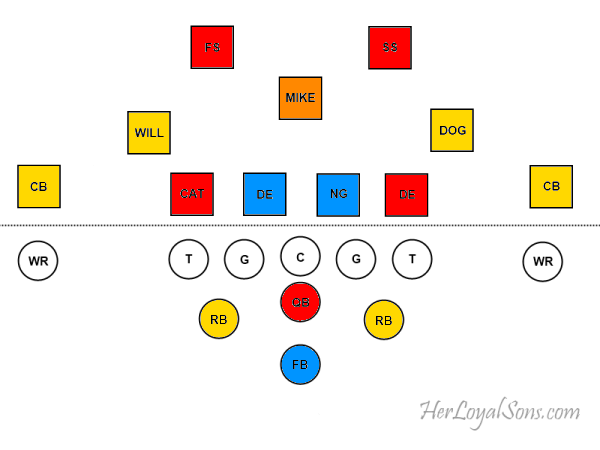 FB Dive (Blue) – The DE and NG function as true interior DTs and attack the A-gaps that they line up over to stuff the dive. QB Keeper (Red) – The Cat and DE get to the outside of the tackle and either make a play on the QB, force him back inside to the waiting safeties in second level support, or force a pitch. Pitch to RB (Yellow) – The outside Will and Dog LBs contain the RB (or “pitch-man”), ensuring they are never beaten to the outside. As soon as they see the pitch, they attack the RB. The CBs serve as additional outside containment. While options #1-3 take care of the usual possibilities of the triple option, #4 was where Notre Dame’s defense was truly dangerous. Diaco used Te’o’s natural instincts and superb closing speed to force Navy into mistakes or quicker decisions on what to do with the football. In 2011, Te’o had 23 tackles combined against Navy and Air Force, with 5 of those being tackles for loss (TFL). In 2012, Navy managed to avoid any Te’o TFL, but Te’o still managed 8 total tackles and 1 INT. As much as Navy tried to avoid Manti, they couldn’t do so completely. To put it lightly, Diaco leaned on Manti and depended on him for defensive success against the option. So now that Manti’s gone, who fills his role? Or does Diaco go back to the drawing board and use a more traditional scheme without any unique wrinkles? Personally, I would love to see Jaylon Smith slide inside and get a shot at filling Manti’s role in this kind of defense. He definitely has the raw talent and he demonstrated some impressive instincts against Southern Cal. If you are going to pick one guy from this LB corps to pretend to be Te’o flying to the ball, give me the one with the best instincts and closing speed. Now, Carlo doesn’t have the same physical tools that Jaylon does, much less Manti. While I think he can do an adequate job in this role, I don’t see him completely filling the void. Because of this, I expect to see a lot more safety help than we are used to seeing. Specifically, look for the Strong Safety (SS), Elijah Shumate, to fill this role, giving almost a 4-4 look to the defense and, in a sense, having two people fill in the Manti void. This then leaves the Free Safety (FS), Austin Collinsworth, to play “center field” and serve as the last line of defense on any run and ensure no receiver beats the secondary deep should Air Force sneak in a deep pass. The Irish will most certainly miss Manti in defending the option, but Diaco has more than enough talent on this current squad to compensate. do you think Calabrese and Fox are fast enough to cover these options? we read throughout the spring how much weight the boys have gained then come fall we see how much slower they are,we will see. They’ve been fast enough to cover teams with a lot more speed than Air Force, so yes. Neither of them have Te’o’s speed, so that’s why you will see more safety help than in previous years.